The molecular structure, atomic coordinates, bond lengths, bond angles, molecular orientation and packing of molecules in single crystals can be determined by X-ray crystallography. Single crystal X-ray diffractometer collects intensity data required for structure determination. Used in structural chemistry and biology. The monochromatic X-rays incident on a plane of single crystal at an angle theta are diffracted according to Bragg's relation 2d sin(q ) = nl where d is the interplanar spacing of the incident plane, l is the wavelength of X-rays and n is a positive integer. The intensity of the diffracted rays depends on the arrangement and nature of atoms in the crystal. Collection of intensities of a full set of planes in the crystal contains the complete structural information about the molecule. Fourier transformation techniques are used to determine the exact coordinates of atoms in the unit cell from this data. 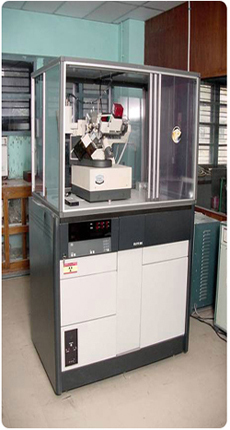 Enraf Nonius CAD4-MV31 single crystal X-ray diffractometer is a fully automated four circle instrument controlled by a computer. It consists of an FR 590 generator, a goniometer, CAD4F interface and a microVAX3100 equipped with a printer and plotter. The detector is a scintillation counter. A single crystal is mounted on a thin glass fiber fixed on the goniometer head. The unit cell dimensions and orientation matrix are determined using 25 reflections and then the intensity data of a given set of reflections are collected automatically by the computer. An IBM compatible PC/AT 486 is attached to microVAX facilitating the data transfer on to a DOS floppy of 5.25" or 3.5". Mo and Cu targets are available. Maximum X-ray power is 40 mA x 50 KV. Polaroid camera is available. UPS backed power supply takes care of the instrument during power failure for short periods. The ideal dimensions of the single crystal required are approximately 0.3 x 0.3 x 0.3 mm3. However, these dimensions may vary based on the habit of crystal growth and the diffracted beam intensity. It is necessary to submit unit cell dimensions of the crystal. The samples must be sent in sealed Lindemann's tubes in case of unstable compounds. Please send freshly grown crystals for good results.